With this iExpression you can combine two texts (a foreground and a background text) by placing the first on top of the other (i.e. the foreground preplaces some part of the background text). With this, you can, for example, embed some message into a randomly generated text block, or can create more complex text blocks by placing one random text block on top of another one. Link this variable to the source text of the text layer containing the background text block. 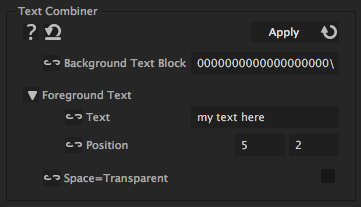 The forground text that should be placed on top of the background text block. Can also be linked to a multi-line text block. In which column and row of the background the foreground text is inserted. With this option space characters in the foreground do not replace background characters.